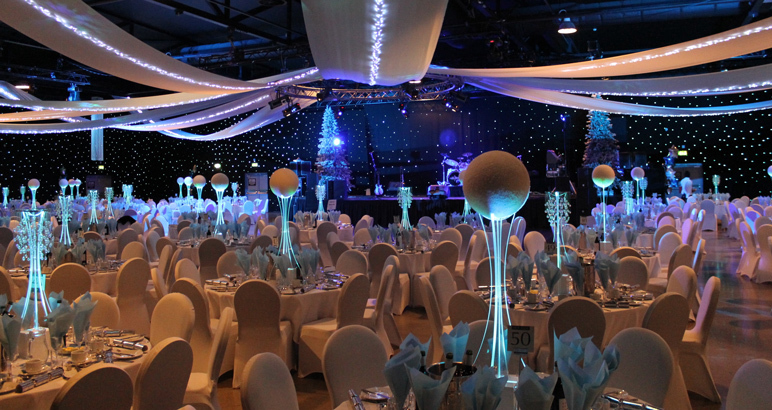 Now that we’re almost into British summertime it’s the perfect time to start planning your work Christmas party. Our guide gives you all the best tips and things you need to know to ensure you put on the best event your company has ever organised. We’d love to manage your event from concept to completion but if your budget doesn’t’ stretch that far why not engage us to find you the perfect venue? If you’ve been delegated the task of organising the Christmas party, the first thing you will need to know is the budget. You don’t want to start making unrealistic plans for an event that requires twice the budget you have, so find out what it is and make sure you also have a contingency for emergencies or unforeseen costs. It be a daytime or evening event? You make it a bespoke event or go for a pre-organised package? Partners be invited (and if so, will they be charged for tickets)? You provide food as a buffet or book a sit-down Christmas meal? You have enough numbers to take over a whole venue, or do you want to do a shared party night with other companies? It all take place in the one venue or will it be e.g. a meal in one place with drinks or dancing at another venue? The day of the week is as important as the date itself, so decide on this as soon as possible. Weekdays nights are often cheaper and more available but you have to think about whether you chance staff being in a fit enough state to come in next day. (If driving is part of their role, or they drive to and from work, remember they may still be over the limit in the morning.) Friday and Saturday nights are more popular for this reason but availability will be limited and prices will be higher. Venues will now start to get booked up very quickly so don’t delay. As soon as you’ve made a decision send a “Save the Date” email to all staff to ensure a good turnout. If the quote is negotiable. Are there any opportunities for a discount (remember Christmas is their busiest time so you may not have the luxury to haggle)? A meal or a buffet is generally expected at a Christmas party – would everyone prefer a sit-down meal or a light buffet (to allow more time for socialising and dancing)? Don’t forget to plan for vegetarian or special dietary requirements in advance. It would be a good idea to organise menu tasting if you’re booking for a lot of people – the food that’s served at a Christmas party can make or break an event so make the right choice for your company and your staff. Getting the balance right with free drinks is important – too many and you could end up with uncontrollable and unruly staff; too few and you risk the company appearing miserly and lacking in Christmas spirit. A happy medium is what’s required. Vouchers for a certain number of free drinks is one option, or you could offer a bottle of champagne or wine per table if you’re having a sit-down meal. An open bar is a dangerous option, both in terms of cost and potential bad behaviour. Get the music and entertainment right and your Christmas party will be talked about for a long time afterwards. Choose the entertainment to suit your event and your staff. There are endless options if you decide to go with something other than just music and a dancefloor: you could go for a live performer such as a comedian, magician or a stunt show, or you may want to choose casino tables, karaoke or something unusual like giant Scalextric. Dancing is usually a must and it’s the perfect opportunity for everyone to let their hair down and help avoid potentially awkward conversation between colleagues. Decide whether you want a live band or a DJ. If you’re going for the latter, put together at least a partial playlist so the DJ knows what mood to set. Liaise between the venue and DJ or band to ensure you have all the equipment and lighting required – you don’t want to assume he will bring his own lighting and then realise you don’t have any on the night. The Christmas party is the best time to present any awards and thank staff collectively. The timing of speeches should be planned in advance, not done as an afterthought (you don’t want the director trying to be heard amongst a crowd that’s already had a few drinks). Organise a microphone if one is needed, and make sure it won’t go on for too long. Staff won’t want celebrations to be disrupted so keep award-giving and thank yous short and sweet. Venues are rarely local to where every member of staff lives, so it’s important to arrange transport for staff to get home safely. Mini buses arranged in advance for everyone to get to and from the venue are an economical and safe option (some may not be in a fit state to remember there’s a legal alcohol limit and think they can drive). Otherwise collect local taxi numbers or details about local transport (if running at that time of night) and make them available both before the event and on the night. Once you have all the details of the date, time and venue you need to invite everyone. Make sure the way to RSVP is clear and gives a cut-off date well in advance of the event so that numbers for food can be confirmed. You will most likely have to chase people for responses so ask managers of each department to help if you have large numbers of staff. Once you know how many are attending, you may want to organise a seating plan if you are having a sit-down meal. Allowing everyone to sit where they like on the night may result in a bun fight for seats and some people may be very disappointed about who they ended up sitting with (or not sitting with). Much like organising a wedding seating plan, it can be a stressful and extremely difficult task so you could talk to staff and managers for ideas and suggestions about how to put one together. Asking staff for feedback about the event is extra work but can be a huge help for the next Christmas party. By creating an anonymous survey you will find out what everyone liked and didn’t like and possibly save you money the following year – you might not need to rebook that highly recommended magician that cost you and arm -and a leg!